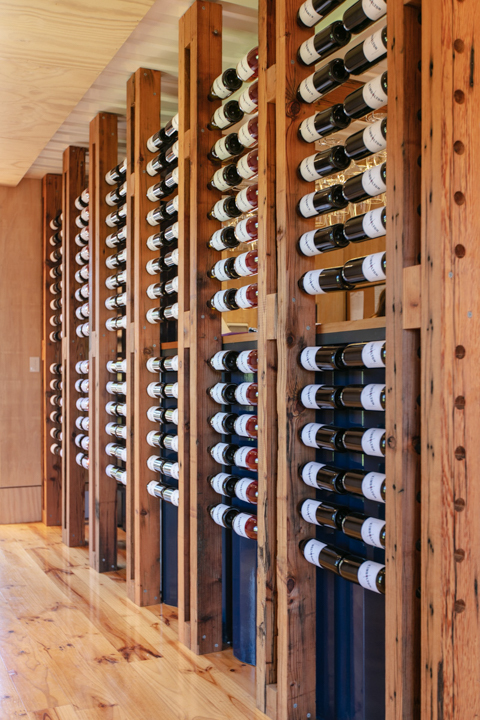 In designing Kimbolton Wines' cellar door, architect and builder Damien Chwalisz has created a soft yet industrial space that showcases the brand's product while also recording its ongoing history. The road to Langhorne Creek from the CBD is serene. Exiting the city via the Southern Expressway, the Adelaide Hills quickly fall away and a flat alternating green and yellow landscape expands before us, interrupted every so often by small towns built in close proximity to farming land. After an hour’s drive, we arrive at Kimbolton Wines. It’s mid-February and the vines are lush – heavy with grapes and thick with leaves, ready for vintage to begin. CityMag has come to the property to meet with Damien Chwalisz, the architect and builder of Kimbolton Wines’ new cellar door. Much of what we’ve seen from the designer in the past has been residential projects. His work is always contemporary and always gives proper credence to context and heritage, even on new builds, but it was Damien’s experience working with shipping containers that brought him to this site. “Through travel, the client was aware of different modes of creating interesting architecture, and a container framed building had caught their eye. They became very interested in adapting this type of building into a cellar door,” Damien says. “We have designed (and built) a few projects utilising containers now, multi-storey projects, single and double level modular structures and we’ve speculated on a number of other residential and retail projects with containers. A weighty recycled Jarrah door, built bespoke by Damien’s construction company, welcomes us. On the left, re-purposed, locally sourced Oregon timber wine racks designed by Damien’s practice display the Kimbolton range, before the space opens up into a tasting room. The bar, also made of Oregon, flows into the building’s second compartment where there is a mix of low tables and bench seating, with a south and westward view across the estate’s oldest vines. While the room is lined with whitewashed plywood, hints of the container’s materiality have been deliberately left on display. “It was important that the containers revealed themselves at times on the interior, and were not disguised,” Damien says. The most prominent clue is the original door of the container, which opens out onto the cellar door’s deck. Within the confines of the balustrade, a Eucalyptus tree sprouts through the deck boards. The entire structure sits within a small Eucalyptus woodlot. Damien worked with the Kimbolton team from the project’s earliest stages and decided on the siting after walking through the property with Nicole and Brad. “There’s a natural landscape that we immediately inherit by situating ourselves within that woodlot,” Damien explains. A cellar door in a eucalyptus woodlot. A roof deck offers previously unfound views of the vineyard and raises visitors toward the canopy, giving the Kimbolton cellar door a unique experience defined by its surroundings. A cellar door is a commercial space – it exists to facilitate tastings and, hopefully, the purchase of wine – but that’s not to say there aren’t aesthetic comparisons to Damien’s residential work. “We wanted that warm, timber, textural, almost domestic, cozy, welcoming feeling, within a robust hardwearing envelope. That was the atmosphere we were going for, and probably the atmosphere that every cellar door, in some ways, should introduce an element of,” Damien says. “When you drive out on a Saturday afternoon, go and see a couple of wineries, you want to be walking into these spaces and be in a warm, welcoming environment. Initially, the architectural intent was for a more hard-lined industrial aesthetic, but as the design development and the building process progressed, the client’s desires called for a more refined level of detail, and so too did the end result. A function of Damien’s business makes this a seamless process; his two companies operate in parallel as both architect and builder, and a lot of the materials come from his own stock of demolition salvages. Throughout construction, Damien’s team was nimble and reactive, allowing the project to evolve to a point where it fit with the Kimbolton brand. While there is heritage in Kimbolton’s history to draw from – the owners’ family came to the property in the early 20th century – Damien sought not to have the architecture interfere with the focal point of the venue: the wine. “For me, the architecture did not need to make that step into being entirely emblematic of the wine region,” he says. Wine and cheese and timber, four ways each. But as visitors pour through the door, lean against the bar and swirl their glasses, an ongoing story of the winery is transcribed upon its many soft timber surfaces. “We selected Oregon as the bar top and the wine rack storage because it will ding and dent and subtly develop a patina in time, so the number of interactions across the bar between the bar staff and the public will be revealed in the surface,” Damien explains. Much of the rhetoric around winemaking tells the story of days spent toiling between the vines for a hand-made product that improves upon itself over time. Through Damien’s design, the Kimbolton cellar door takes those romanticised notions of nature, history, patience and malleability and makes them inhabitable. And there’s no other place you’ll experience it than in Langhorne Creek.